You’ll never guess what awesome thing happened! 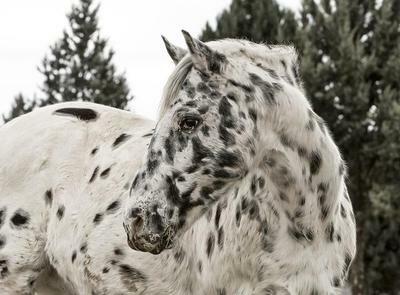 I have just been given an adorable Appaloosa colt!! He is so sweet! I named him Pepper because he’s white with little black spots. Pepper has a coal-black nose, also his mane and tail are basically the same colors as his body. I found Pepper online. He was super cheap... 200 bucks. Getting Pepper is the most amazing thing that has happened to me in a long time! The website said he is only halter broke. So, he’s going to need A LOT of training before I can do anything with him. I asked my parents (with a lot of begging, lol) if I could have a horse, pony, ect. They said simply, "If you you find an awesome, reasonably priced horse, then we’ll buy it." I pretty much knew my mom would say yes. Before she got married my mom lived on her parent's cattle and horse farm. I plan to keep Pepper at Sunnyside Ranch, which is my grandparent’s horse farm. Sunnyside Ranch is about 5 minute away when riding a bike. I won’t even have to buy anything! I have to learn to be responsible with Pepper. My parents declared that I am to work at the ranch 1 hour each day and 3 to 4 hours on weekends! Actually, the more horse time I get the better... Trust me, I’ll be at that place a lot longer than a few hours. Write me soon!